Click on the right arrow for next slide. It's time to CHALLENGE YOURSELF! PUT SOME OOMPH INTO YOUR FITNESS ROUTINE AND TRY SOMETHING NEW AND EXCITING! Cross training: "An exercise regimen that uses several modes of training with the goal of improving fitness, strength and performance." Yes, it sounds serious, but keep reading. By the end, you'll be inspired to cross train YOUR way to awesome! Add some ZING to your workout routine with cross training for whole-body fitness that mixes cardio, strength training, and flexibility! Break free from the everyday and make a change. Changing up your workouts is better for you. By using different muscle groups, you reach a higher level of fitness and keeping things interesting also helps you stick with it. Choose your cross training exercises based on your interests. You gotta love what you're doing so make it your own. Maybe try a lunchtime 30/30. Zing PowerX! 30 Minutes of SPIN and 30 Minutes of strength training and abs. It's important to Include 30-45 minutes of moderate-intensity aerobic exercise on most days of the week, and at least two days of strength training. Supplement flexibility exercises like Barre and yoga into your routine for the max cross training benefit! What Type of Cross Training? Flexibility: Definitely! The ideal cross training program starts with a warm-up and ends with a cool-down stretch. It also includes yoga or stretching. Cardio Vascular: Assuredly! Your cross training routine should include aerobic exercises, such as spinning, Cardio Kickboxing or DanceFit. Strength: For Sure! You should do strength-training exercises like lifting weights or body weight exercises like push-ups at least twice a week. Sports: Not necessarily, but cross training can absolutely help athletes get into better shape, increase stamina and improve performance. Low-Impact: Modify! You can adapt your workouts to be low-impact! The intensity level of your cross training workout is ENTIRELY UP TO YOU. Customize it to your comfort level but try to step outside of it if you can! You and your instructor can always modify any exercise to take down the intensity level if desired so you never feel discouraged. Feel free bring it up by doing higher-impact exercises and using heavier weights! The sky's the limit with a cross training workout! Core - Ab-solutely! Sit-ups, planks, and other core exercises should definitely be part of your cross-training program. Arms - For sure! The strength-training portion of your workouts should include biceps, triceps, and shoulders using hand weights, or resistance bands. You can also use your own body weight for resistance by doing exercises such as push-ups and dips. Legs - Yup! Include strength-training exercises like lunges and squats to work your leg muscles. You'll also work your legs by Spinning, doing jump squats and some of the other aerobic components of your cross training program. Glutes - Right behind you! Many of the same exercises that work the legs, including lunges and squats, are also good for the glutes. Back - We got your back! This is a full-body workout, so you will want to incorporate exercises for your back, like push ups and upright rows with hand weights (the heavier the better). All of these goals and proven benefits of Cross Training are within your reach when you work out at Zing! 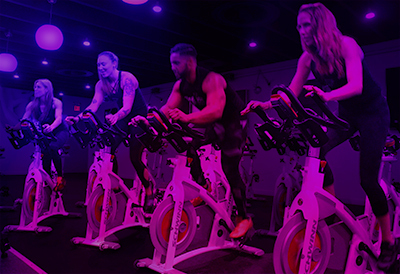 Our Spin classes, combined with our GroupX classes will get you in the best shape ever! Combine any of our strength classes - Extreme Sculpt, Warrior Boot Camp, Butts and Guts, Mat Pilates, BeatBarre, Cardio Kickboxing and Yoga with any of our Spin classes and you will cross train YOUR way to fitness!